This vehicle has entered service at Crook Depot, on "The Castles Express" services X21 and X46. This vehicle has received "The Castles Express" branding. 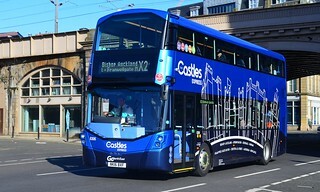 "The Castles Express" will become the new brand name for service X21, replacing "Pronto". 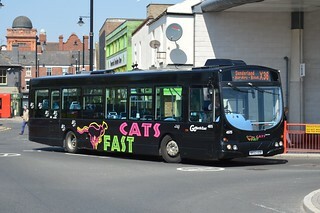 The X21 service links Newcastle, Chester-le-Street, Durham and Bishop Auckland, all of which have prominent historic castles. 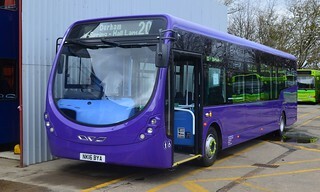 This vehicle, which carries a two-tone blue base livery, has arrived into the Go North East fleet. 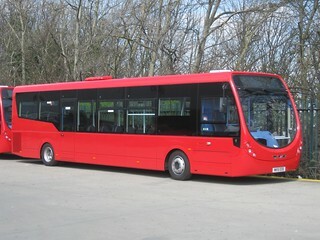 It is currently being prepared for service at Saltmeadows Road Depot. 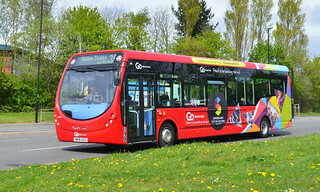 Representing an investment of over £1.5m, this batch of vehicles are believed to be in line to upgrade "Pronto" services X21 and X46. These vehicles feature the latest technology, and are fitted with Daimler 4-cylinder, 5.1-litre OM934 Euro-6 Emission compliant engines. 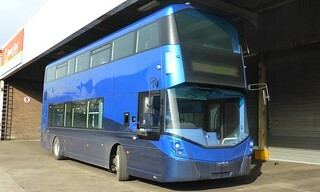 Internally; they feature Esteban Civic V3 seating complete with e-leather; four tables on the upper saloon; two-colour Tarabus 'Wood Effect' flooring; and blue accent lighting, which is fitted underneath seats, to provide extra light on the gangway. This vehicle has received a special promotional livery for Sunderland City Council's #Sunderland2021 City of Culture bid. Go North East are proud to be 'backing the bid' for Sunderland to win UK City of Culture 2021, and are showing their support by raising awareness of the scheme.